It was my Master’s Thesis defense with Roger Pielke, Jr. and two other advisors from the private sector who had flown to Boulder just for the event. During my presentation, I had a small audience in addition to my advisors. The audience was my dad and my roommate Jen. As I started my talk, I had no idea that my dad had communicated with Jen for weeks leading up to these day. My dad had concocted a plan. A very funny plan. As I flipped to my fourth or fifth slide, my dad and Jen -- sitting next to each other -- held up signs. Since they were behind my advisors, the only person that could see the signs was me. And what did these signs say? One was in the shape of a big “D”, and the other was in the shape of a white picket fence. Yep, my dad took a signature move out of the football fan’s playbook and brought the “D-Fence” cheer to Grandview. I laughed out loud at the time, and can look back and laugh still...because ultimately I did pass the defense. Roger Pielke, Jr. keeps reminding me that when my business takes off, he’d be happy for me to set up a fund to support the center. Hopefully that day isn’t too far off! 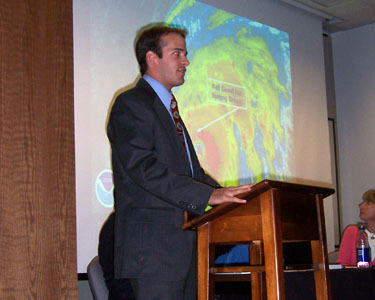 Joel Gratz, graduate student CSTPR 2003-06; MBA/MS, Meteorology and Policy, 2006; Founder & Meteorologist, www.Opensnow.com and www.ChanceOfWeather.com.